Titanfall 2's PC system requirements also indicate the hardware you'll need to run it at 4K. The recent Titanfall 2 tech test didn't make it to PC, citing "hardware variety & 'min spec' optimization," as the reasons. Now that the test (and the resulting changes) is well behind us, Respawn is ready to tell gamers just how much PC horsepower they'll need to harness to run the upcoming shooter. Interestingly, they've included three separate list of hardware. In addition to the usual minimum and recommended specs, there's also an "Ultra 4K60" list, whose purpose should be self-explanatory. What do these specs mean? 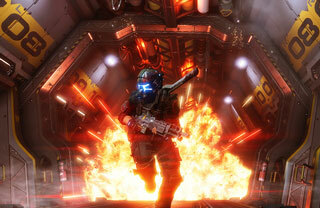 Producer Drew McCoy said in a blog post that, "Our goal for minimum PC specs on Titanfall 2 is that you can play at a 1600x900 resolution with most details turned on and average around 60fps. We strongly believe that if you at least match the posted requirements you should have an excellent visual and gameplay experience playing the game, so don't be alarmed if you boot it up and don't need to turn all the settings to Low for playable framerates." As to the 4K specs, McCoy says that they are "what you'll need if you want to achieve 60fps while playing the game at a whopping 3840x2160 (aka '4K') resolution and average around 60fps." You can see all the new tech, see benchmarks, and read all about the PC-specific options (like FOV and more), in the blog post on the official Titanfall 2 website. Titanfall 2 is launching on PC and Xbox One on October 28.